Do You Really Need to Wear Glasses ? As far as I am concerned(and according to my research regarding this subject matter), the prerequisite “need” to wear “Glasses”, which seems to be exhibited by some individuals who reside in today’s so called “modern” society, is in-fact an “illusion”. By “Illusion”, I mean to say that it is an out-right “Fraud”. Whether an individual may have been diagnosed(tricked into a particular way of thinking with regards to the level of health that they currently possess on a physical level)as having “Myopia(Short-Sightedness)” or “Hypermetropia(Long-Sightedness)” is besides the point. I shall now elaborate briefly upon the two most common physical “Visual-Afflictions”, which have been alluded to above. This is the terminology used to describe a somewhat compromised physical condition, in which the human “eyeball” has become elongated, due to the muscles of the eye becoming too “tense” for prolonged periods of time. This elongation leads to an angular malfunction, whereby the light-rays entering the eye, end up converging too early, before reaching the retina. The result of this malfunction, is of course,the “blurred vision” experienced by the visually afflicted individual, whenever they attempt to focus upon anything that may be of a significant distance away from their own physical eyes. This is the descriptive term for the physical condition where visual impairment has ensued, due to the “eyeball” being shortened in length. This shortening arises as a result of the eye-muscles, of the now “Spectacle-Wearing” individual, becoming far too tense over prolonged periods of time. Again, as in the above mentioned explanation of “Myopia”, this angular malfunction leads to a deviation in the light-ray convergence, as it enters into the eye with the aim of “hitting” the retina in a time appropriate, as to induce clear vision. However, the difference in this case is that the light-rays seem to converge far too late(IE-:Theoretically, “Behind the Retina”). The result of this “Biologically Induced Angular Failure” if you will, is of course, more or less the same as before. Being the “blurred vision” experienced by the visually afflicted individual, whenever they attempt to focus upon anything that may be of too close a distance in proximity to their own physical eyes. 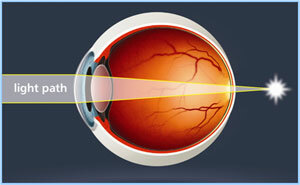 As seen in the above image, the light-ray converges at the optimal point, “hitting” the retina in a time appropriate, as to induce clear vision, as the eyeball has neither been elongated or shortened. Vision is therefore in optimal working condition. In both cases, the prolonged period of tensing of the muscles in and around the eyeball, is usually, and more often than not, a physical manifestation of stress, in conjunction & intertwined with, regarding as well as in relation to Astrological & Metaphysical forces, of which I will not go into detail upon at this point, as it would take up too much space & time. Eyesight can and has been corrected without the “use” of “Eye-Glasses”. On a physiological level, a series of Eye-Exercises can be undertaken in order to retrain the eyes in how to “see” correctly once more. Many of which were made famous by a physician called William Horatio Bates, who popularised many of these physical exercises and in turn, aided in the “solution” to a large amount of so called “visual problems” exhibited in a great many individuals, who were diagnosed as suffering from some type of visual impairment. In addition to these “Eye-Exercises” there are many different herbs that can be taken to improve eyesight. The main three that have been used traditionally are Calendula/Marigold Flower, Bilbury and Eye-Bright. As these plants are high in beta-carotene, which converts into Vitamin A, they therefore possess the ability to aid in the fortification of the retinal tissue of the eye and thus, improve and/or maintain eye health. Also, it would be extremely advisable for anyone who seeks to obtain an improved level of eyesight, to (if not done so already) increase their intake of fresh fruits & vegetables, while cutting-down upon if not completely eliminating “Processed-Foods” from the diet altogether. In addition to this dietary guideline, and as far as my research indicates, the number one food that can be consumed as a means of improving one’s eyesight, is 100% Organic Blueberries, which just so happens to be, by no creation-al coincidence whatsoever, a form of fresh fruit. “PinHole-Glasses” are a type of specially designed “Spectacles”, that appear at first glance to be a form of Normal “Dark Sunglasses”. However, upon closer inspection, one will realise that in the place of where the lenses of the glasses are usually familiarly located, are instead a large number of pinhole-like gaps/holes, hence the name “PinHole-Glasses”. These “holes”, allow the eye to re-learn how to optimise focus and thus “see” correctly once more, without the equipment itself causing any health detriment regarding the visual efficacy of the actual eye itself. Rather, it improves eyesight overtime, dependent upon frequency of use. 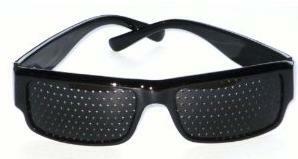 Wearing these eye apparatus for just 5 minutes daily, can result in major improvements with regards to vision. The only reason that “Eye-Glasses” are marketed toward, promoted & pushed upon “Us”, is for the sole purpose of increasing the financial profits currently being generated by the “Eye-Glasses” manufacturers/optician companies. In-fact, the very design of “Eye-Glasses” is geared toward the purpose of making our eyesight even worse! “No One Needs to Wear Glasses. Upon the Subject in Question”.